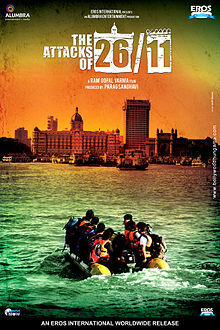 The Attacks of 26/11 is a movie directed by Ram Gopal Verma on the horrific and barbaric terrorist attack on the city of Mumbai and in essence, a proxy war waged against India, beginning on 26th November 2008. Many expected this movie to be a dud or even worse, a disastrous rendition of an event that shocked us all. Contrary to all that, the movie is nothing like these descriptions and makes for a good watch. The movie was more of a play-out the events drama, so the plot was not something that was woven out of thin air but rather the actual truth stitched together piece by piece. RGV uses an interesting narrative angle: The Joint Commissioner of Mumbai Police narrating the incidents to an inquiry commission. This too was inspired from the actual commission which deposed Rakesh Maria(the actual JC at the time of the attacks). Nana Patekar essays the role brilliantly, as he not only acts, but embodies the character, flowing with it in a tone which is hard to describe but if I had to, I would put it this way: “ Aisa lagta hai ki he was the actual JC at the time of the attack”. A young newbie actor Sanjeev Jaiswal plays the role of Mohammed Ajmal Amir Kasab, the terrorist who was captured and later hanged. Although I didn’t have my hopes riding on him, Sanjeev does a decent job playing the character. He has a mean look throughout the movie which tends to get a bit over the top at times but overall, is not too farcical. Lastly, the flaws. The movie was a bit abrupt and short for me. For starters, it didn’t cover the shootings at Nariman House, Oberoi Trident and Taj adequately. The brave operation by the NSG which resulted in the extinguishing of the terrorists was omitted. Also, the role of the attack’s masterminds was just touched upon briefly and not detailed. To end it, all I will say is this. The movie released on 1st March 2013. 3 days later, nearly all shows at the cinema nearby are sold out. Mind you, this being a RGV movie, is a complete surprise after his recent debacles. So, this movie has something. Something that packs a punch. This entry was posted in 26/11, 26th November, Bollywood, Movie, Movie Review, Nana Patekar, Ram Gopal Verma, Sanjeev Jaiswal.